An issue with Emu cropped up a few weeks ago that was seemingly caused by upgrading from Ubuntu 16.04 to 18.04. However, the problems only seemed related to using Emu via the GUI; users could still use Emu as a headless computer via SSH. When initially logging in to Emu. This is showing that Emu is still running Ubuntu 16.04, not 18.04 as presumed! An error in the GRUB config generation process when upgrading packages. These two bits of information led me to believe the problem wasn’t that the system upgrade to 18.04 was incompatible with these old Apple Xserve hardware (since the upgrade didn’t actually get implemented) and instead was that the upgrade might have been initiated, but aborted, which modified the GRUB configuration file(s), breaking the GUI; much like the problem I previously addressed earlier this summer. When I fixed the display/GUI issues with Emu and Roadrunner earlier this summer, I noted that the /etc/default/grub files on each of the computers were slightly different, despite the fact that these two computers should be identical. So, I replaced the /etc/default/grub file on Emu with the file from Roadrunner and rebooted Emu. Voila! Emu now has a functional display/GUI again! 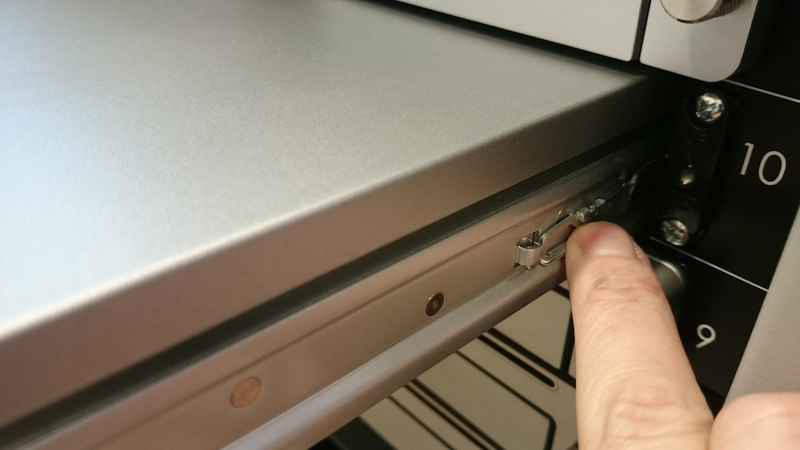 Due to hardware limitations on the Apple Xserves we have, we can’t use drives >2TB in size. 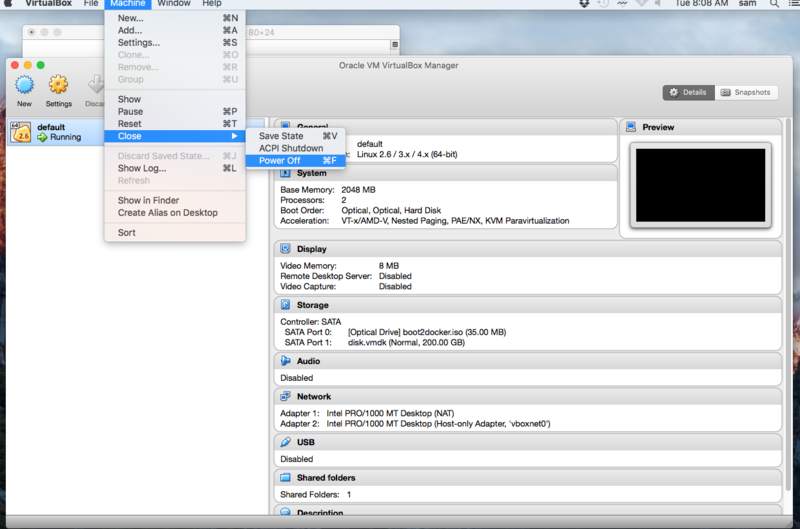 “Bigfish” was set up to be RAID’d and, as such, has three existing HDDs installed. We wanted to upgrade the HDD size and convert over to Linux (Ubuntu) so that we could utilize the Linux operating system for some of our bioinformatics programs that won’t run on OSX. I installed Ubuntu 16.04LTS to the SSD boot drive (128GB) and installed three, 2TB HDDs. However, it cannot detect the HDDs due to the Apple hardware RAID controller! 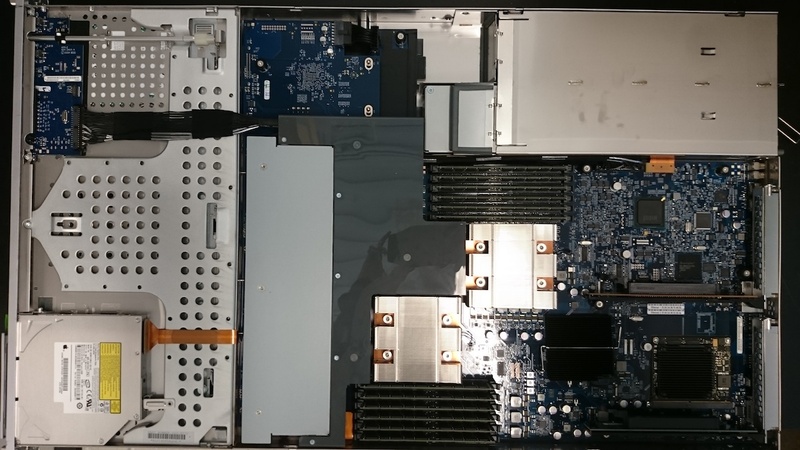 Searching the internet has revealed that this is a commonly encountered issue with RAID’d Apple Xserves and Linux installs. I haven’t come across a means by which to remedy this. Will likely have to install an OS X version in order to make this computer usable. Although, that won’t limit us too terribly in regards to program usage. Most programs will run fine on OSX. 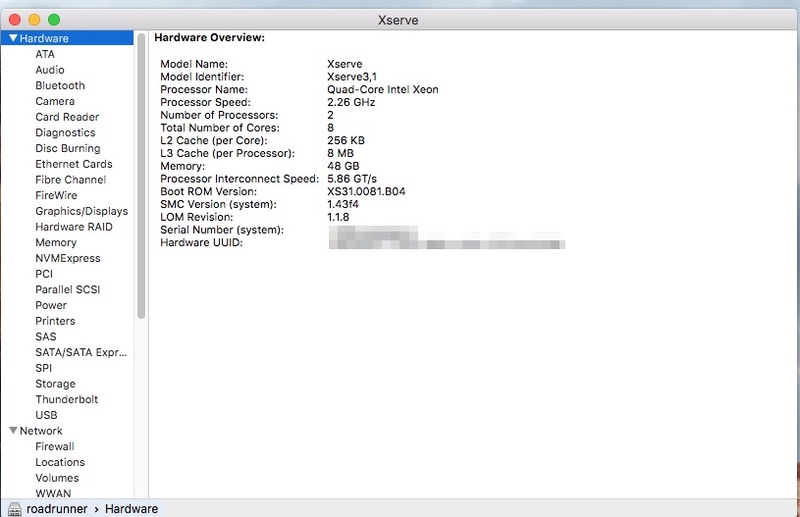 Sean got the remaining Xserves configured to run independently from the master node of the cluster they belonged to and installed OS X 10.11 (El Capitan). The new computer names are Ostrich (formerly node004) and Emu (formerly node002). He enabled remote screen sharing and remote access for them. Sean also installed a working hard drive on Roadrunner and got that back up and running. sudo defaults write /Library/Preferences/com.ap\ple.loginwindow LoginwindowText "TEXT GOES HERE"
sudo scutil --set HostName "TEXT GOES HERE"
I recently moved some computing jobs over to Amazon’s Elastic Cloud Computing (EC2) in attempt to avoid some odd computing issues/errors I kept encountering on our lab computers (Apple Xserve 3,1). Let’s look at how things’ve worked out so far. First, how much did we spend and how did we spend it (click on the image to enlarge)? Of course, it’s easy to see that for the instance I was running, it cost us $0.419/hr. That’s great and all, but you sort of lose sense of what that ends up costing over the long-term. Let’s look at how things break out over a larger time scale. According to Amazon’s (very useful!) billing breakdown, we spent $187 in the month of July 2016. This doesn’t seem too bad. In fact, this would only cost us ~$2200/yr if we continue to run this instance in this fashion. However, let’s look at it a bit further. We see that the instance ran for a total of 374 hrs during July 2016. Divide that by 24hrs/day and we see that the instance was running for 15.6 days; just over half the month. That means we would’ve spent ~$374 for the full month, which would equate to $4488/yr. 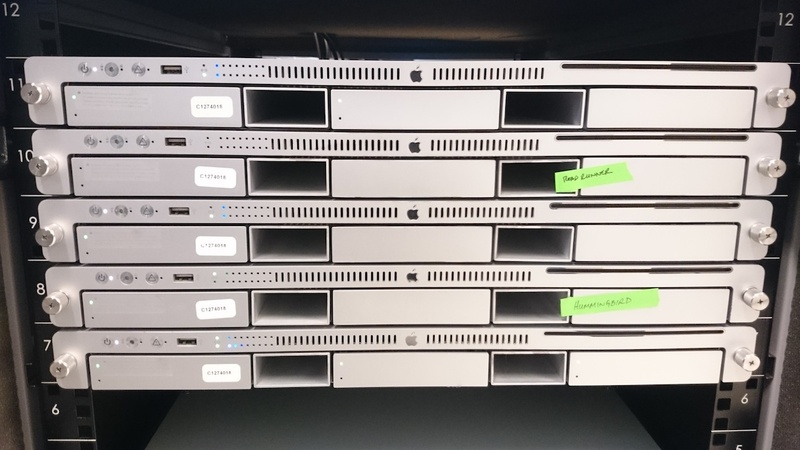 For our lab, that kind of money starts to add up and one starts to wonder if it wouldn’t be better to invest in higher end hardware to use in the lab with a single “sunk” cost that will last us many, many years. Regardless, with the lab’s current computing hardware, we should compare another factor that’s involved with the expense of using Amazon EC2 instead of our lab computers: time. I performed a very rough “guestimation” of the time savings that EC2 has provided us. Of course, these times don’t take into account any technical issues that we might encounter (and I have encountered many technical issues using roadrunner) on either platform, but I can tell you that I’ve not had any headaches using EC2 (other than unintentional, self-imposed ones). 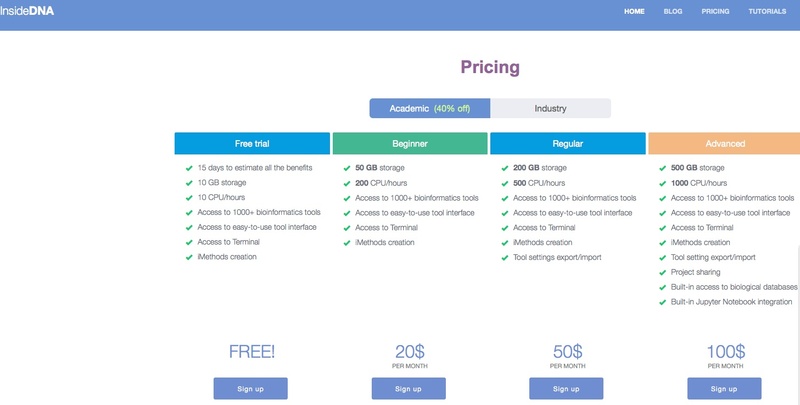 The “Advanced” tier ($100/month) certainly seems like it could potentially be better than using Amazon. However, this tier only offers 500GB of storage. If you look up above at the Amazon pricing breakdown, you’ll notice that I’ve already used 466GB of storage for just that one experiment! Additionally, the 1000 CPU hours seems great, but remember, this is likely divided by the number of CPUs that you end up using. 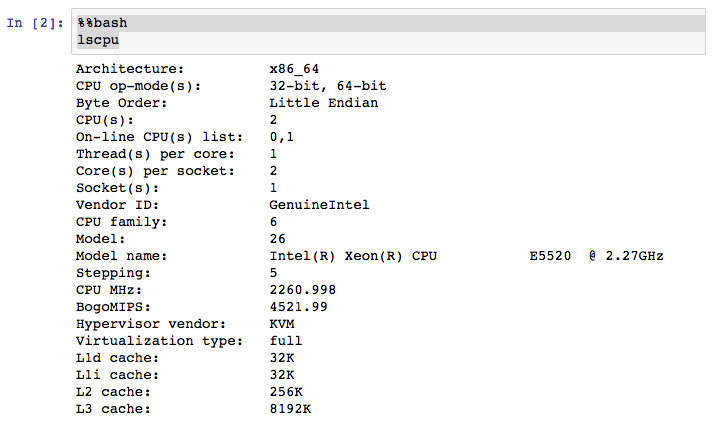 The Amazon EC2 instance was running eight cores. If I were to run a similar set up on InsideDNA, that would amount to 125 CPU hours per core. Again, looking up above, we see that I ran the EC2 instance for 374 hours! That means the “Advanced” tier on InsideDNA wouldn’t be enough to get our jobs done. 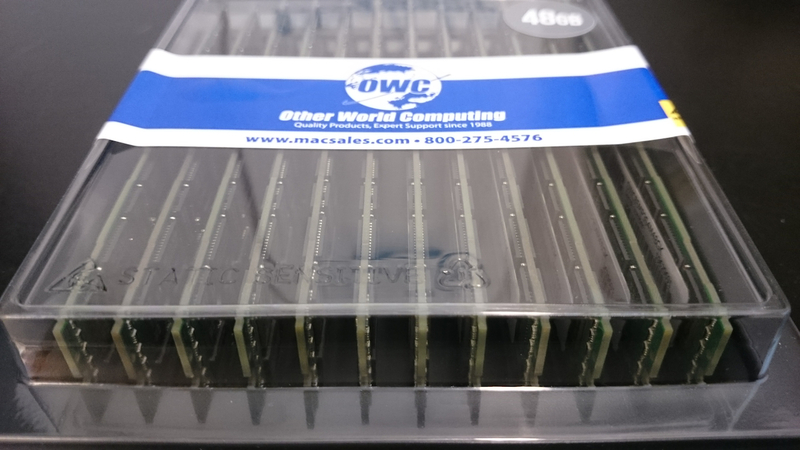 Replaced the filters on the rack enclosure that houses the Apple Xserver server blades we have in the lab. I noticed a discrepancy between what system info is detected natively on Roadrunner (Apple Xserve) and what was being shown when I started a Docker container. It’s important to notice the that the Docker container is only seeing 2 CPUs. Ideally, the Docker container would see that this system has 8 cores available. By default, however, it does not. 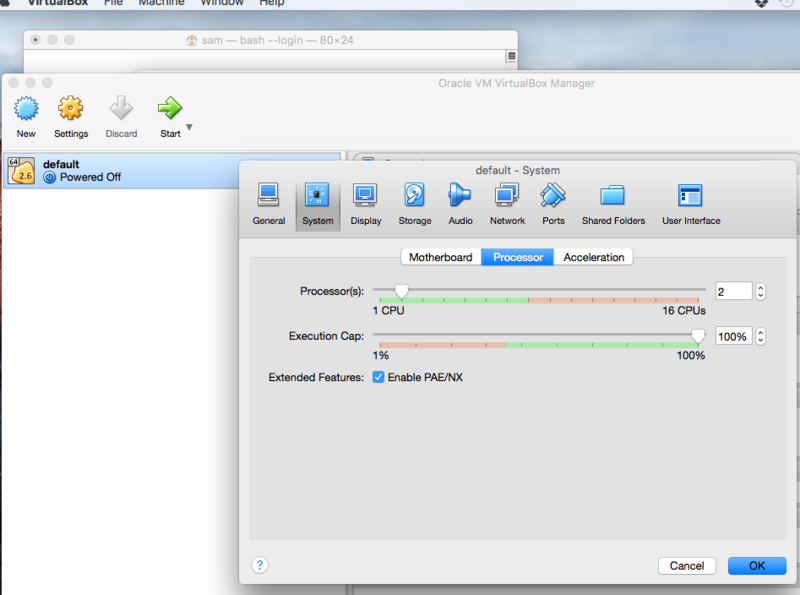 In order to remedy this, the user has to adjust settings in VirtualBox. 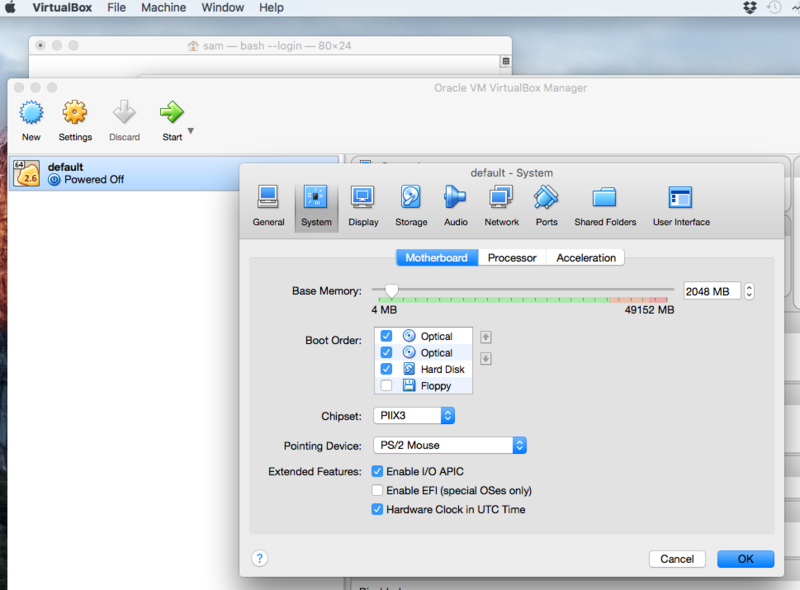 VirtualBox is a virtual machine thingy that gets installed with the Docker Toolbox for OS X. 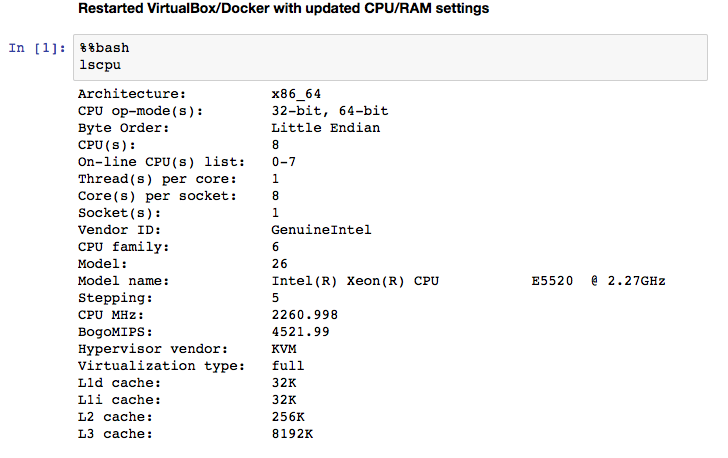 Apparently, Docker runs within VirtualBox, but this is not really transparent to a beginner Docker user on OS X. To change the way VirtualBox (and, in turn, Docker) can access the full system hardware, you must launch the VirtualBox application (if you installed Docker using Docker Toolbox, you should be able to find this in your Applications folder). 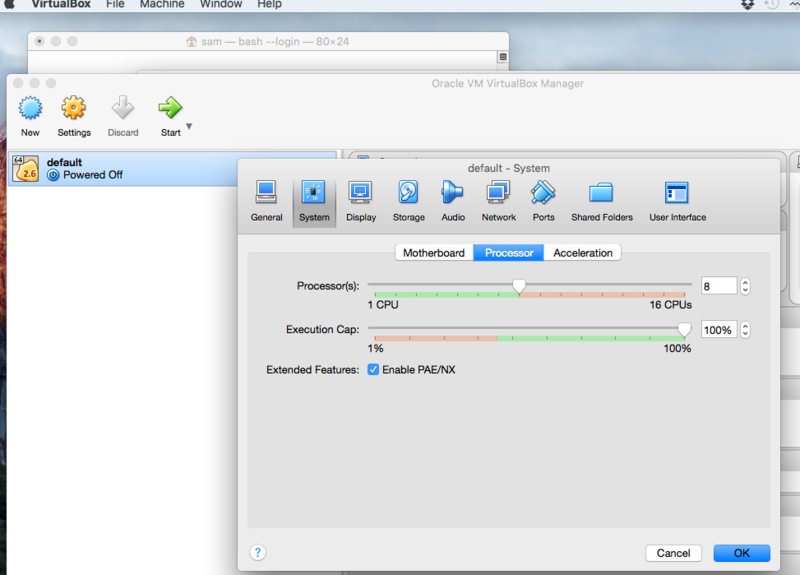 Once you’ve launched VirtualBox, you’ll have to turn off the virtual machine that’s currently running. Once that’s been accomplished, you can make changes and then restart the virtual machine. 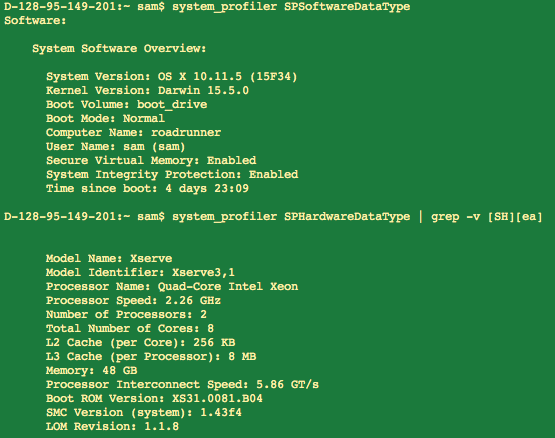 Looking at the CPUs now, we see it has 8 listed (as opposed to only 2 initially). I think this means that Docker now has full access to the hardware on this machine. This situation is a weird shortcoming of Docker (and/or VirtualBox). Additionally, I think this issue might only exist on the OS X and Windows versions of Docker, since they require the installation of the Docker Toolbox (which installs VirtualBox). I don’t think Linux installations suffer from this issue. 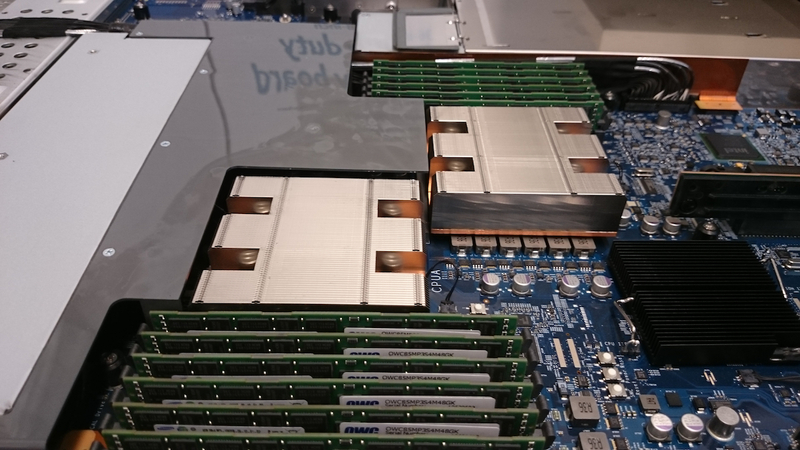 We received the new 48GB RAM set we ordered from Other World Computing for the Apple Xserve (roadrunner) that I installed El Capitan (OS X 10.11.5) on two weeks ago. I installed it and this computer (which was plenty quick before) is extremely responsive now! Here’s an overview of some of the struggles getting node003 converted/upgraded to function as an independent computer (as opposed to a slave node in the Apple computer cluster). 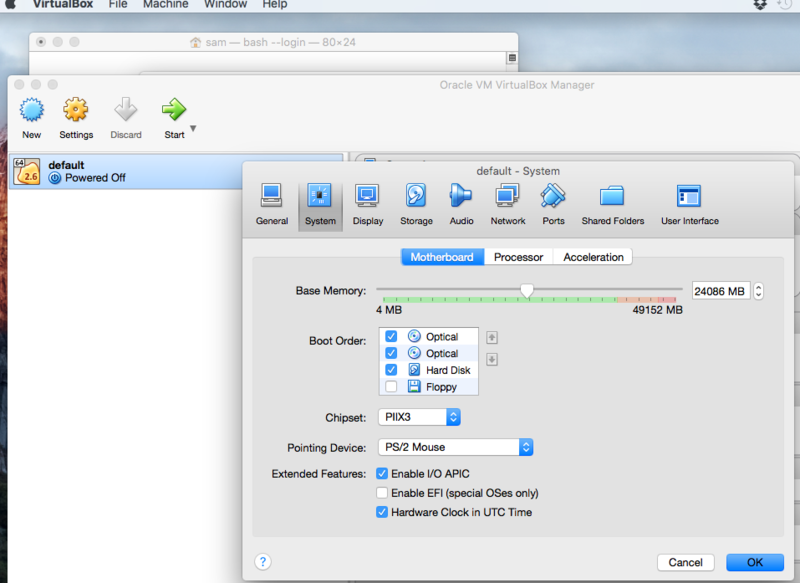 Probably due to node003 being part of cluster – reformatted original node003 drive with clean install of OS X Server. Booting from USB now an option and worked with 6TB HDD! Installed OS X 10.11.5 (El Capitan) on old 1TB drive and inserted into node003 – worked perfectly! 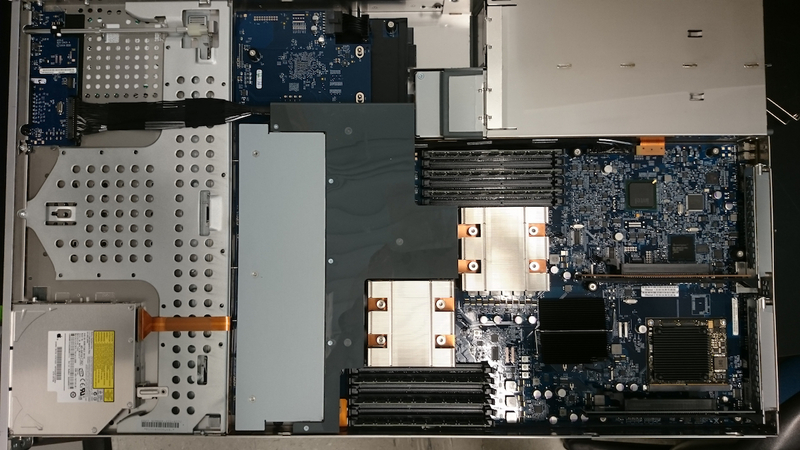 Current plan is to upgrade from 12GB to 48GB of RAM and then automate moving data off this drive to long-term storage on Owl (Synology server).